NOTES: New tool 'Easy Assembly' kit. The P-47 was the most produced American fighter of World War II. It could literally obliterate targets with its eight .50 machine guns and, something remarkable, was the mount of the US top scorer in Europe, the late Francis Gabreski. The Thunderbolt followed a similar route to the P-51, having first been produced with a razorback, but it acquired a bubble canopy from the block 25 of the ‘D’ version and kept it. It served in the Pacific as well, giving valuable ground support to the troops fighting in the jungle and it eventually flew right into the sixties in South America; nowadays, you can still hear its big Pratt & Whitney R-2800 growl at air shows. 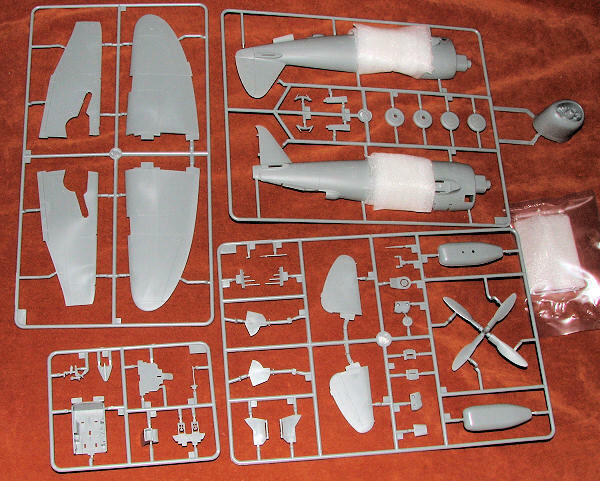 Hobby Boss started in the kit business by doing easy to assemble 1/72 kits. I am sure that many of us have built and enjoyed these kits. Now it is time to look at 1/48 for these types of kits. The first one I have seen is this P-47D Thunderbolt. As you would expect, all of the mounting tabs are quite large and I am sure that most if not all the kit can be assembled with no or minimal glue. Starting with the cockpit, there is a nicely done interior that has a seat, instrument panel with gunsight, control stick and a set of head armor that fits into a tub. There is a decal to fit over the instrument blanks on the instrument panel. A tail wheel well with gear snaps into place and before you put together the fuselage halves, you need to insert some exhaust flaps in the front and the turbo face in the aft fuselage. Wings have nicely done wheel wells with the tires trapping a plastic tubing section. This is later pressed onto the one piece main gear/lower gear piece. The inner doors and upper outer doors slot into tabs. Wheels have covers. The engine is molded into the forward cowling piece. Before attaching this, you stick another of those tubing sections to hold the Curtiss Electric asymmetrical prop (oddly, the markings guide shows you installing Hamilton Standard logos). The leading edge section that has guns is separate. You have a one piece canopy and the flat looking centerline tank. As with any simplified kit, things are pretty basic. The turbo outlet doors are molded in the closed position, so no need to cut the fuselage insignia for these. The biggest thing missing are wing pylons. This is a bit of a mystery as just about all if not all bubble top P-47s had these on the wings. Granted, they could be removed, but the vast majority of images show them mounted. The aircraft also does not have the dorsal fillet carried on later war P-47Ds. Markings are for two planes. Both are shown on the box art and will require considerable masking and painting by the builder. One is the P-47D-25 of Francis Gabreski while with the 61 FS/56 FG in RAF Green/Grey over RAF Light Grey. This plane has full D-Day stripes on the wings and lower fuselage as well as the white tailplane stripes. It carries a red rudder and forward cowling. All this will need to be painted. 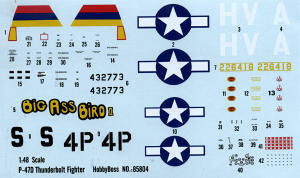 The other is the P-47D-30 of Howard Parts with the 531 FS/405 FG. This one has the invasion stripes on the lower fuselage with black tailplane stripes. The red on the cowling will need to be painted as will the invasion stripes. Decals are nicely printed and should work quite well. I should mention that the wheel wells are shown as painted chromate green when they should be chromate yellow. Interior is dark bronze green, I believe. I am sure that many will be quite pleased with this kit. It is well molded and has the sort of detail that one expects with modern kits. I do wonder at the complex camo scheme for what is basically a semi-beginner's kit. Those who are really into the P-47 may well pass on this one due to the lack of wing pylons and fact that the prop and wheels may not be applicable to the markings offered in the kit. 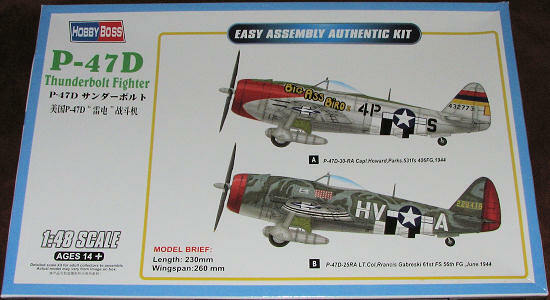 I should mention that I am not a P-47ista so do not know if these items are proper for the markings provided. I would hope that one will let me know one way or the other. This sort of thing is somewhat common with their quick build 1/72 kits so in many ways is to be expected. It is obvious that this kit, like their similar 1/72 offerings, is aimed at the beginning modeler. If you want what looks like a pretty trouble-free build and are not picky about things such as matching markings, prop and wheels, and the lack of pylons is not a concern, then this is one you should seriously consider. Late note: I received the following from those who know more than I on the subject: "According to photos, both versions of the airplane shown should have the Hamilton-Standard prop. In fact, all versions of the P-47 prop could be used and was. I have a photo of a 78th FG razorback using the prop the kit has, while many people think each version had a specific prop, that isn't the case. The Gabreski airplane did not have under wing pylons. The 405thFG bird did." Thanks to Squadron Products for the preview kit. Get this one today at your local shop or have them order it for you.